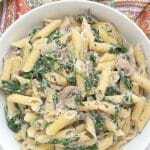 Creamy Spinach & Mushroom Pasta is easy to make in under 30 minutes with only a few basic ingredients. You won’t miss the dairy or oil in this delicious dish. Thank you to my friends at GO VEGGIE® for sponsoring this recipe! I hear all the time about how difficult it is to give up dairy. And I agree it’s not easy. In The Cheese Trap, Dr. Neal Barnard talks about how addicting cheese is, and how to ditch it for good. And fortunately there are a lot of brands with vegan non-dairy cheese products on the market now. Being able to enjoy familiar flavors and textures makes it a lot easier to transition to a plant-based diet without feeling deprived. One of the brands I’m particularly impressed with is GO VEGGIE®. While not all of their products are vegan, it’s easy to spot the ones that are since they have a lavender “VEGAN” on the label. I have been buying their vegan cream cheese for a long time. I love it on bagels, in Strawberry Cream Cheese Waffle Sandwiches, and in Vegan Cream Cheese Sandwiches. And recently I discovered GO VEGGIE®Vegan Grated Parmesan Style Topping. It’s delicious on pizza, pasta, and salads. 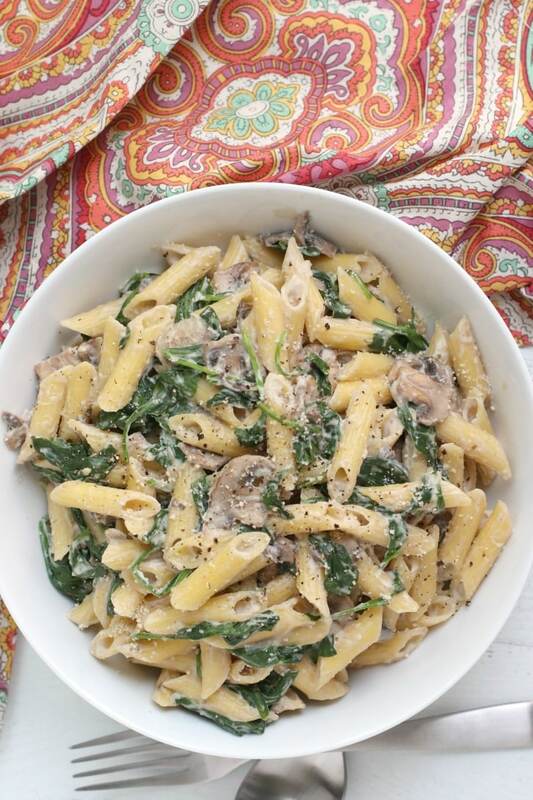 I decided to incorporate this non-dairy cheese into this recipe for Creamy Spinach & Mushroom Pasta. The base of this sauce is made with raw cashews which are blended with water to form a cream. Adding the Parmesan-style topping gives it a little extra cheesiness and tang. And I like to allow my guests to sprinkle some extra on top, as well. It tastes so much better than the dairy version I grew up with! 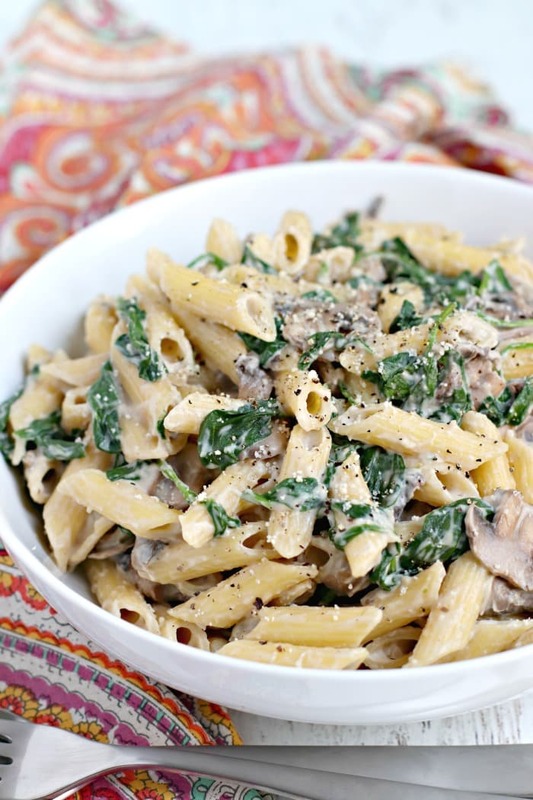 Making Spinach & Mushroom Pasta is easy! You can use any shape pasta you prefer. I usually choose gluten-free penne, but it’s also great with spaghetti. While the pasta is cooking, I blend the raw cashews with water until completely smooth, usually for a couple of minutes. If you don’t have a high-speed blender, it helps to soak the cashews in hot water for at least 30 minutes to soften them. Or you can soak them overnight in your refrigerator. Then after the pasta is done, I leave it in the strainer and use the same pot to saute the garlic and mushrooms. Less cleanup is always a plus! Once the mushrooms are cooked down, the baby spinach and cooked pasta go in the pot. I give everything a quick stir, then add in the cashew cream. After it’s mixed in, I add the vegan Parmesan and salt and pepper, to taste. Then it’s time to eat! 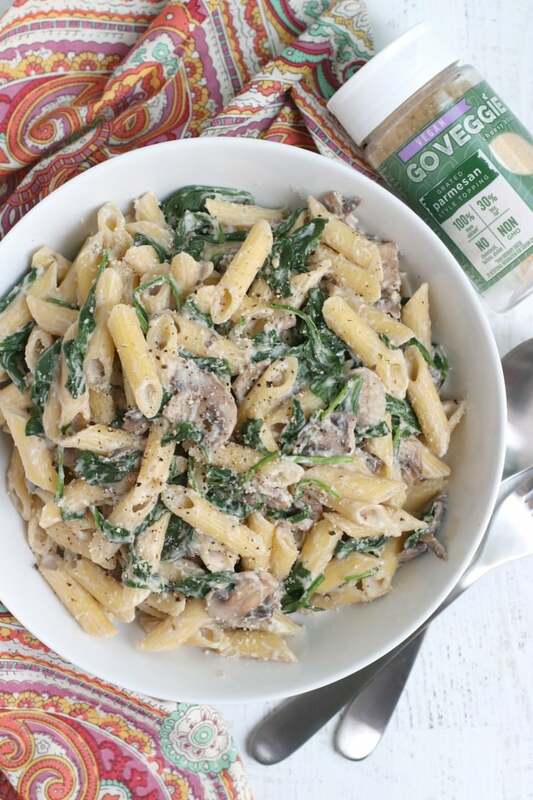 It’s a delicious meal high in protein, iron, and vitamin A.
Creamy Spinach & Mushroom Pasta is perfect for both weeknights and special occasions. Since it already has vegetables in it, it’s a complete meal. But if I have time, I like to serve it with a fresh salad like Mediterranean Cucumber and Tomato Salad or Grilled Eggplant Salad. And if you’re looking for more easy pasta recipes, some of my favorites are Spaghetti with Lemon Cream Pasta Sauce and Instant Pot Pasta Puttanesca. 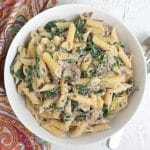 Now let’s make Creamy Spinach & Mushroom Pasta! 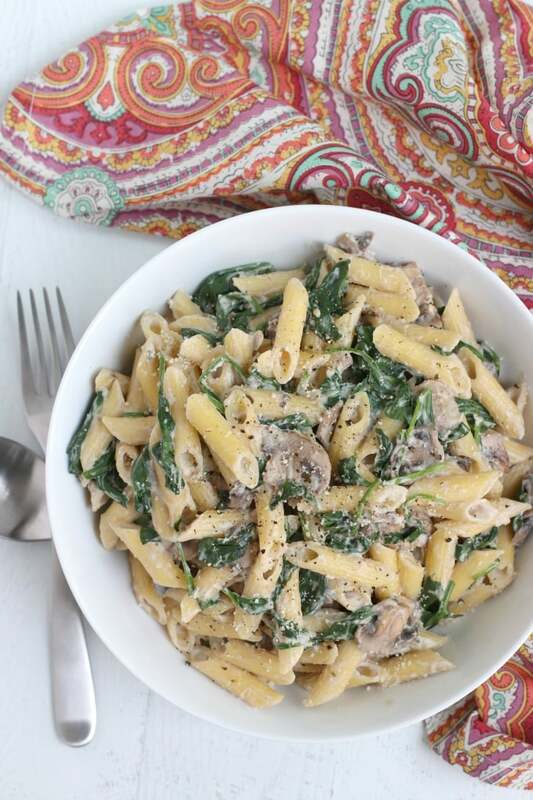 Creamy Spinach & Mushroom Pasta is easy to make in under 30 minutes with only a few basic ingredients. You won't miss the dairy or oil in this delicious dish. Cook the pasta in a large pot according to the package directions. Drain and set the cooked pasta aside. Meanwhile, combine the raw cashews and water in a high-speed blender. Blend for a few minutes until completely smooth. In the same pot you used to cook the pasta, warm about 2 Tablespoons of water over medium heat. Add the garlic and saute for 30 seconds. Add the sliced mushrooms and saute until they are soft, adding more water as needed if the pan appears dry. Add the baby spinach and cooked pasta to the pot. Stir to combine. Then add the cashew mixture from the blender and toss well. The spinach should start to wilt and cook down. Remove the pot from the heat. Add the GO VEGGIE® Vegan Grated Parmesan Style Topping and stir again. Taste and add salt and pepper, as desired. Serve immediately. Tried this recipe?Let me know what you think by leaving a ☆ rating and comment. And share your photo on Instagram and tag @veggiessavetheday and #veggiessavetheday! Ooh this looks perfect for Valentine’s Day. Or any day! I love how quick it is, so you can have something fancy feeling without all of the work. Thanks Becky! It’s really fast and easy to make! Can u please let me know can u get the go veggie products in Dubli, Ireland ? Hi Bernie! Right now they are only available in the United States and Canada, but hopefully they will be expand to Ireland soon. You’re right, giving up dairy is not easy, but seeing recipes like this, makes it all a little bit easier! And cashews work so well in achieving these super creamy textures! Delicious! Thanks Anna! I love using cashews in recipes. I’m not a huge fan of pasta, but I will admit, your recipe sounds delicious and it is one that I would definitely make. And thanks for mentioned the Go Veggie cheese. i haven’t tried that brand yet, but will keep an eye out for them. Thanks Jen! That’s a huge compliment! Yay! 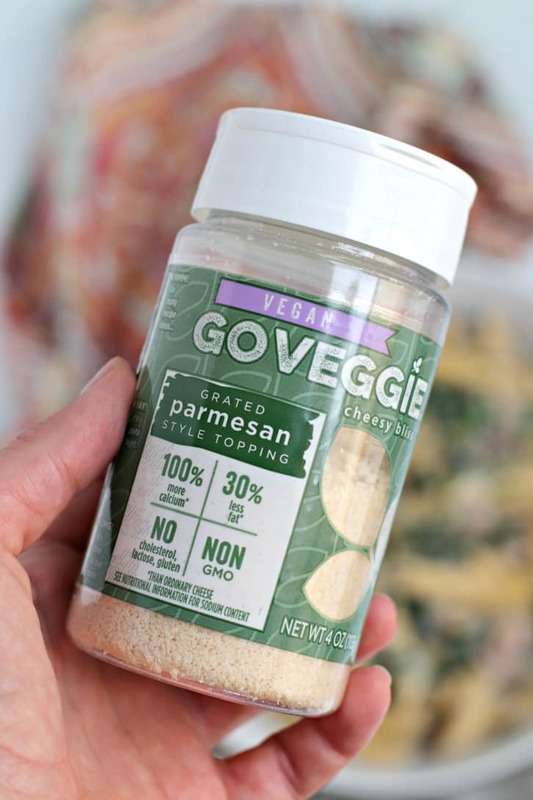 I love Go Veggies’ parmesan cheese. And it looks so so good on this pasta. Can’t wait to give it a try! Thanks Sarah! I really like the parmesan in this sauce. Yes, that’s all I hear from people when I say I’m vegan – how it’s too hard to give up dairy. This pasta is a great way to show people that it’s not as hard as they think! I’ve been eating so much pasta this past week, you’d think I’d be sick of it, yet your pasta is making me drool. Can’t get enough of that cheesy goodness. Thanks Nicole! We eat a lot of pasta, too. Good use of vegan cheese, I haven’t heard of this and also of cashew in pastas. Love that this is healthy and easy to prepare, perfect dish for all occasions with simple ingredients but definitely filling. Thanks Ashley! I love using cashews to make creamy sauces. And there are so many delicious vegan cheese on the market now. I’m 100% a sucker for the creamy pasta. It always hits the spot! Can’t wait to try this. Thanks Katie! I wasn’t a fan when I ate dairy, but now that I’m vegan, I love creamy pasta! Ooh, I love a creamy pasta dish! My boys would especially love all of the mushrooms! Yum! Thanks Sarah! Mushrooms are really good for them! Thank you so much, Chanel! I will have to try it with gnocchi next time!